Lutez tout autour l’alambic, adaptez le mamelon au vase de reception avec beacoup de ‘securite’; graisse additionnee de gypse ou propolis ou chaux huilee, ou comme vous voulez, et mettez a cuire dans du fumier de cheval ou d’ane ou a la chaleur, d’un poele a sciure out d’une bougie a coquemar ou avec n’importante quelle autre source de chaleur d’intensitie equivalente, a condition qu’un main d’homme la supporte plus ou moins. Which might mean the use of gypsum or lime with oil to seal the joint securely. ‘Propolis’ unfortunately is not in any French dictionary that I can find, despite being exactly the word as printed in Mertens edition published by Les Belles Lettres. This recipe abjures you to ensure that there is a proper seal at all times, indicating some experience with the problems of the technique. The chronologically next note of lute that I have to hand is in the Kitab-al-Asrar of Rhazes (9th century AD or so)(G. M. Taylor’s thesis translation). It has a recipe for lute for coating the outside of glassware that uses ground iron slag, egg white, which is then coated with artists clay. Salt and clay are used to seal the tops of vials, the stuff moistened obviously so that it sticks together. This artist’s clay is made from pure red or white viscous clay, free from stones, dampened, pilverized, dried, ground, sifted through silk, saturated with water in which rice bran was softened, kneaded thoroughly, then add an equal amount of rice, then to each pound ten dirhams of table salt, a third pound of ground and sifted pot sherds, and a handful of animal hair, cut up as fine as possoble. There is also mention of a way of sealing beakers using cloth strips and a paste smeared on a cloth, the paste being lime and egg white, or salt and barley flour and mallow herb. The Book of the Composition of alchemy (perhaps earlier than Rhazes), mentions lute but calls it just clay with salt added, so not a very comprehensive recipe, although clearly drawing on the same tradition as Rhazi. There is mention of Clay of wisdom in the Two treatises attributed to Avicenna in the Ambix article by Stapleton, Husein and Lewis, page 58. Also page 51 and once earlier lute mentioned. The authors have a note at the bottom suggesting this substance is that from the kitab-al-asrar, and the recipe from there. The “Clay of Wisdom”, as described by al-Razi in the K. al-As1’ar (Lucknow MS,f. 7 v.) was composed of the following ingredients: I 1’a#lof finely divided lin QU1’r(literally “freeborn clay”; i.e., free of sand and stones: see Mem. ASB, Vol. I, 4, p. 63 note I; idem, Vol. VIII, 6, p. 382; ct. Dozy, Suppliment aux dictionnaires arabes, Vol. II, p. 81) fermented with water in which the coarser siftings (orts) of rice-flour had been soaked; I 1’a11 of pure sifted dung, one-third of a 1’a/l (Mem. ASB, VIII, 6, p. 382 prescribes 3 ralls) of finely powdered earthenware; 10 dirhams of table salt; a handful of chopped animal hair (I rail = 128,. dirhams). Then we pass to western Europe, where Geber’s Summa Perfectionis mentions lute for sealing things up in the section on sublimation and the vessel for the sublimation of marchasite, but doesn’t appear to give a recipe. It is also mentioned in the section on distillation, very definitely for sealing the vessels, but interestingly, the methods of distillation are to use a water bath or an ash bath; there is no need to protect the glass vessel from the flames themselves. This is repeated in John of Rupescissa’s “ Quintessence”, only with paper, fine flour and egg white used to seal the glass vessels shut. I can find no mention of lute in Thomas Charnock’s breviary, Thomas Norton’s Ordinal or Chaucers Canon’s Yeoman’s tale, although Charnock mentions making glass vessels with stoppers as close as a hair to the vessel. Humfrey Lockes treatise from the 1560’s has mention of luting vessels shut, but no recipe for it. The 1500AD “book of distillation”, by the non-alchemist surgeon Heironymous Braunschweig, has a recipe for linen cloth dipped in salt water, dried, then wetted in the white of an egg, dried, then used to lute things, it seems to suggest also add fine clay but tempered as before, which seems to mean with dung, and or flax threads. 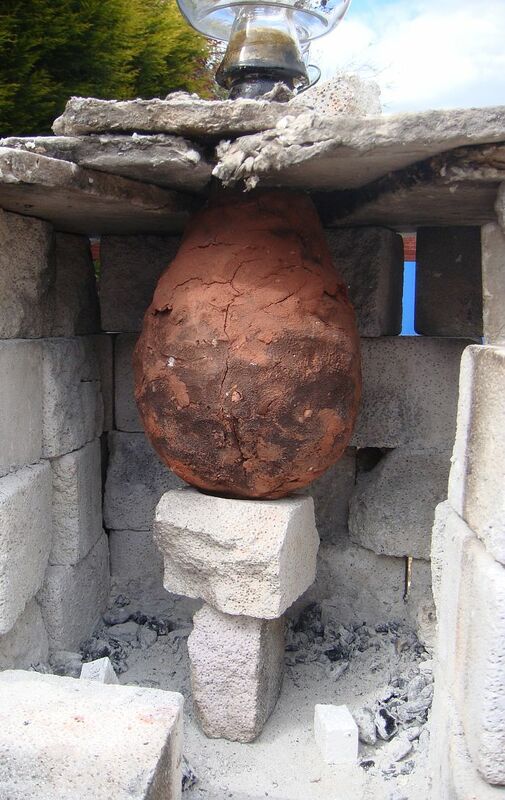 The vessels themselves, apparently use an Arnald of Villanova recipe, 2 parts loam or clay, one of horse dung, mix, and add some powder of tile stones or powder of unslaked lime, mix with salt water. This certainly indicates the transfer of distillation knowledge from alchemists to physicians, although that probably occurred nearly two centuries earlier, when spirits of wine started to be made in large amounts as a medicine. In fact Heironymous writes “Thus have I shown you diverse manner and ways of luting and how to be ordered. If you desire any more to know thereof, you may enquire that of the alchemists”. It is not clear what Cretan earth is, but it is probably a type of clay. Ripley’s Bosom book mentions lute twice, but as the covering for glass vessels, no mention of specifically how to seal them together. The 1540 The Pyrotechnia by Biringuccio – page 185, lute for making parting acid, fastened glass together with linen strips with flour, a little egg white and ashes, or some thin lute, his lute recipe, he calls it lutum sapientiae, lute of wisdom (a name stolen from the alchemists), uses a lean clay, mixed with a 4th part of wool cloth clippings, an 8th of washed ashes, a quarter of mule or horse dung, mixed together, and put onto the cucurbits. He also gives the useful advice when it is all finished to separate the glassware by moistening the lute with ordinary water. Agricola, De Re Metallica, page 441, uses linen cloth with egg white and flour to join the glassware, although it is not called lute; the glassware is then covered with lute. The problem is, exactly what is this other lute made from? He mentions it many times, for covering the outside of glass vessels, the outside and interior of furnaces, for lining runways for molten metal. Unfortunately the index is rather poor, and although google books finds 47 instances of the use of the word lute, the Hoover edition only mentions it once. Altogether this does suggest that Agricola did not know as much as he would like us to think he does, something already obvious by the way he cribbed information from Biringuccio. Manufacture of parting acid, page 137. First a recipe for luting your glassware, which is made of loam, wash it, 10 parts of this, 2 parts washed ashes, 3 of horse manure, one of hammer scale and 2 parts beaten off cow hair, mix together, moisten with fresh ox or sheeps blood that should still be warm. The lute for sealing joints, he also says it is a ‘thin mixture’ is made from egg white, beaten, soaked up into sponge and back into bowl, then 4 lots of fine flour mill sweepings, 1 of armenian bole, 2 of dry white cheese without the rind, 1 of dragon blood, grind all finely then pass through a hair sieve, mix with the egg white and seal the joints. Another recipe for lute for glassware uses loam, dragons blood and Armenian bole, a third part of potters clay and half a third of a part of unslaked lime. All are to be powdered separately, moistened with egg white, or with warm ox or sheeps blood, and as much cloth scrapings as or shearings from fustian as bole is to be mixed in well. Thinking historically, are any of the recipes contingent on local or easily supplied materials materials? Some are perhaps, such as use Armenian bole, dragons blood, although they seem rather expensive for the purpose they are used for. Will there be differences in performance of each lute? Probably not much. At least one text notes that different recipes are used for clay vessels and glass ones, which makes sense given their different constitution. Given the probably importance of the use of eggs by Zosimos for actual alchemical works, I think it clear that since later alchemists use them for luting that by then they are not so important. So maybe it is another piece of evidence for practical alchemy turning away from organic methods, towards unity of kind, that is, metals are one kind and organic substances are another, and you can’t turn one into another. Of course some recipes, famously those in the 12th century Arabic treatise de Anima in arte alchemiae, use a lot of organic substances, but historians of science are still somewhat unclear whether they are cover names or not. So what do the eggs do in use? When pasted with flour to linen, they will form a nice layer of proteins which will bake together like a biscuit when heated, making a nice seal, only I wouldn’t like to use them if the temperature is going to get high enough to burn it. But at least, being very organic, it won’t react with most substances being distilled. There are definitely 2 types of lute as well, one for protecting glassware, another for sealing it, and the latter is the earliest type. This is a logical separation of purpose, and it is clear that the glassware one contains clay because you need that to withstand the heat, and horse dung and wool clippings because it probably originated in the types of mixture used for casting bronze into. These additions are to give it strength and structure when it is drying and perhaps some porosity when fired which then gives it a bit more of an insulating function and a bit more give than a solid ceramic mass. It is also possible that the precise function changes over time. The later recipes definitely require a thin lute and don’t always use cloth strips, because the glassware fits together quite well, as you can see in the pictures of the period. Earlier glass and pottery though does look like it needs more packing for the joint, external support for the joints and even earthenware vessels were luted. This matches with the increased use of lute for the exterior of the glass vessel seen in later medieval recipes. Earlier ones, not intended for the 500 to 700C or so attained when making mineral acids, do not focus as much on the need to protect the glassware. But then the later recipes also reflect the increased sophistication of method and of the written record, and there is a possibility that this apparent change over time is simply down to different things being recorded in more detail. For example, the Kitab al-Asrar of Rhazi talks about making various waters by distillation; some are probably highly acidic, some not, but it takes until the later medieval period before we can be sure that good high temperature operations are being carried out with the regular manufacture of acids. Hence when you are doing it every day in an industrial setting you require good strong glassware that will last a long time, but I suspect when the recipe using a special water is one of many options, it doesn’t matter so much. Also a lot of distillations require mercury or arsenic, which don’t need so high a temperature to vaporise as some of the minerals to do breakdown. Interestingly, Lazarus Ercker has the most complex recipes for lute amongst the non-alchemists artisan class of recipes, even more so than many alchemical ones. I wonder why? Maybe there was a genuine improvement in performance with the recipe he gives, or else he just didn’t want to mess with an inherited recipe which did the job. Experiments might settle the matter one way or another but I have plenty more things to do and getting hold of ox or sheeps blood, cow hair, amernian bole and dragons blood would be difficult. Further experimentation is required, but I am already certain that the precise recipe of the lute for supporting glassware doesn’t matter, as it doesn’t matter when used for copper alloy casting moulds. And since the lute for joining glassware is frequently mentioned, it probably works well enough too. But then I start wondering just how well the cucurbits and alembics fitted together. Unfortunately, since so few have survived, it is hard to tell, but the shapes of those which have done suggests that it isn’t a very good joint, and to keep the alembic steady on top of the cucurbit does require a lute which will dry and set in place, so we return to the primacy of function over form and meaning. Certainly lute recipes is an understudied area of alchemy, although there may not be much to say. If I have any more ideas I’ll let you know. I have been informed by David Reid that propolis is related to bees. It turns out to be a sort of resinous substance made by bees from tree resins etc, to seal off bits of the hive and other uses. So using it here with lime and oil makes perfect sense, although it does have it’s limiations, being most useful for low temperature distillation. Heat it too much and it would melt or burn. I haven’t seen it in later recipes, I wonder why not. Maybe they forgot about it? Or it wasn’t useful enough and people stayed with the egg white, flour and linen recipe which might be a bit cheaper. Where did you get your alembic? Did you make it yourself? I got it from Ian Pearson, a scientific glassblower in Caithness. It’s made of pyrex so as to make life easier- it means there’s more distortion in the glass but it is stronger and less likely to be broken by changes in temperature. He also made the cucurbit that I am using, although the luted vessel you see there is a modern piece of scientific glassware.